Get your hands on unique gear from Outbreak Packs, Rainbow Six Sieges’ limited-time loot boxes. With the release of Rainbow Six Siege’s new zombie mode “Outbreak”, players can get their hands on a new premium loot crate called Outbreak Packs. These packs drop rewards from a unique prize pool, and are also guaranteed not to contain duplicates. Getting your hands on these Outbreak Packs is pretty straight forward, though it might leave a hole in your wallet. Outbreak Packs are only around for a short amount of time, leaving the game when the Outbreak game mode departs in early April. 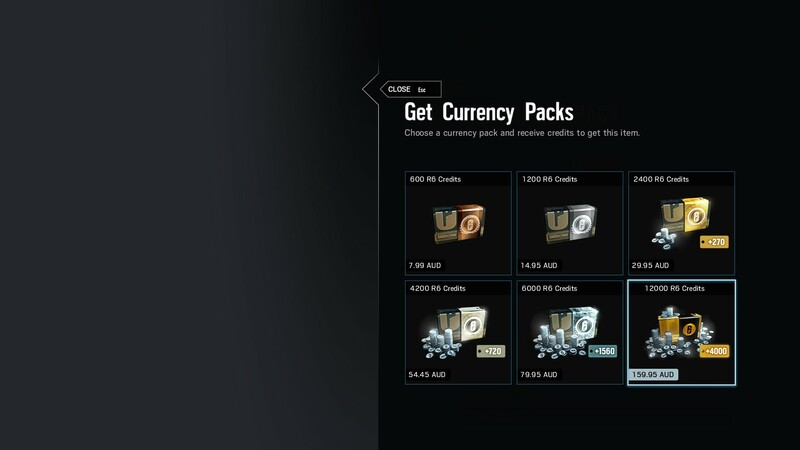 For now though, players who want to collect some of the time-sensitive rewards will want to know how to get more Outbreak Packs in Rainbow Six Siege. These packs can reward some awesome gear, such as Elite Skins, which you can equip on your Operators. 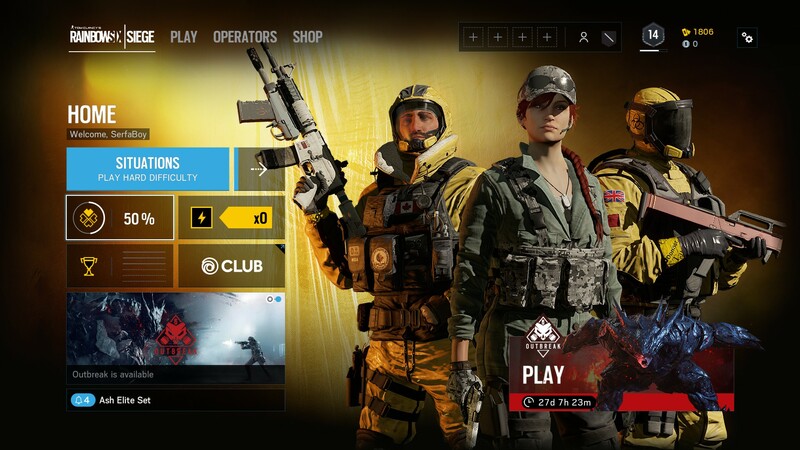 To find where to get Outbreak Packs, start at the main menu where you will see a collection of four buttons on the left. You will need to select the top-left button which looks like a nav-point or waypoint, or perhaps some kind of yellow four-leaf clover. In this new menu, switch from the Alpha Packs to Outbreak Packs. Below you will be able to see three options: Open Now, Get Packs, and Collection. 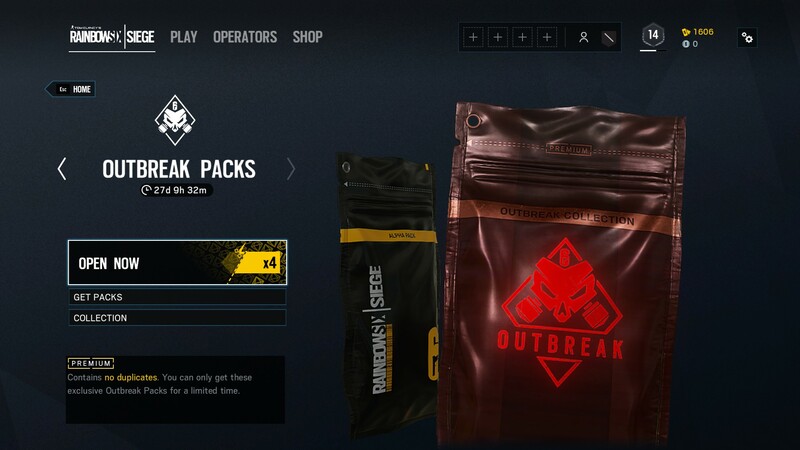 The Open Now option is only available if you have any Outbreak Packs, if you do not have any, you’ll need to select Get Packs to purchase any amount you please. There are five different Outbreak Pack bundles you can purchase, ranging in price. Unlike purchasing R6 Credits, there is no incentive to purchasing bigger bundles, as the price-vs-quantity is fixed. 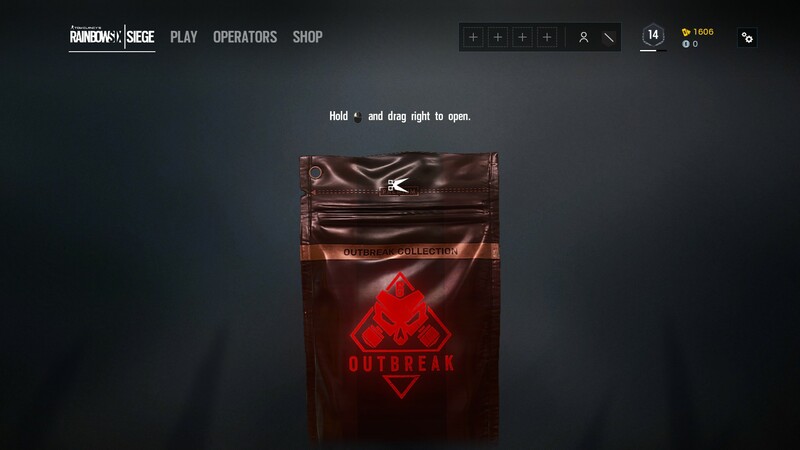 Each player can only receive 50 Outbreak Packs, and 4 are given for free at the start of the event. Clicking this button opens up a new dialogue box where you will see six different R6 Credit packs. Thes bundles increase in price, but the greater the price, the more bonus credits you receive. Obviously, the price varies depending on your country. Just select the bundle with the amount of R6 Credits you require to purchase the amount of Outbreak Packs you want. It’s worth noting that if you have the Rainbow Six Siege Year 3 Pass, you will receive a 10% price reduction on Renown and R6 Credits. If you plan on playing Outbreak for quite a while, or even want to get involved in the base game, it could be worth picking up the Year 3 Pass. Getting more Outbreak Packs isn’t the most complicated procedure, but you will need to go through a few steps to get more. Firstly, ensure you have plenty of R6 Credits, and if you don’t, purchase them using the in-game store. With your R6 Credits in hand, navigate to the Alpha Pack and Outbreak Pack menu, and select “Get Packs” to purchase however many you want. You’ve only got a short amount of time before the Outbreak Packs are taken out of the game (don’t worry, you’ll keep the gear you’ve collected), so get them while you can!